In the market for a highly rated countertop induction burner? The Chef's Star Portable 1800W sells in a competitive price range and gives you an outstanding range of settings to cook your food to perfection. Let’s take a look at those settings in detail along with the other features and benefits. I’ll also alert you to any drawbacks. Plenty of Temperature and Power Settings Make This an Adaptable Burner: While many other units only include 8 or 10 temperature settings, you get 15 with the Chef's Star - along with 15 power settings. As a result, you can use this burner for frying, boiling, braising, and more. Equipped With Key Safety Features: There is a pan detection system which ensures the appliance will only operate if a compatible pan or pot is sitting on it. Another nice safety feature displays an “H” when the cooking surface is dangerously hot. When it cools down enough to touch, the “H” goes away. Choose the Type of Control Interface You Prefer: With the Chef's Star, you choose the type of controls you are most comfortable using: buttons or a touch pad. This model can handle larger pots without any hassles. More than one customer mentioned using a 12” pot and getting even heating all around. A lot of other portable induction heaters are too small for this. The fan is audible, but it isn’t too noisy. Note that you will never find a silent induction burner. They do not exist. The cooking surface heats up quickly, allowing for fast and efficient food preparation. More than one customer mentioned how pleased they were with the stability and construction of this device. The five-foot cord is a bit short, but needing to purchase an extension cord for a unit like this is typical. If you adjust the temperature or wattage settings up or down, the display reverts to the default. So if you forget the setting you had before, you might have to look it up; this can be annoying (but it can also be avoided with a little extra planning). Some customers had problems with error messages; this did not happen with the model I tested. There is nothing you cannot cook on this surface thanks to the adjustable settings and the wide temperature and power ranges. You can cook with it indoors or take it to an outdoor event. The Chef's Star is a popular model, though not as well-known as some of the other induction burners I have reviewed, like the Secura 9100MC. Its functionality is just as advanced as that of the 9100MC, and its features are quite similar. I would say quality control with Secura is slightly better, but in all other respects, the Chef's Star Portable Induction Cooktop can easily compete. Interested in an induction burner, but want a cooktop which offers more than just 10-15 temperature settings? Read this review! The Chef's Star Portable 1800W sells in a competitive price range and gives you an outstanding range of settings to cook your food to perfection. 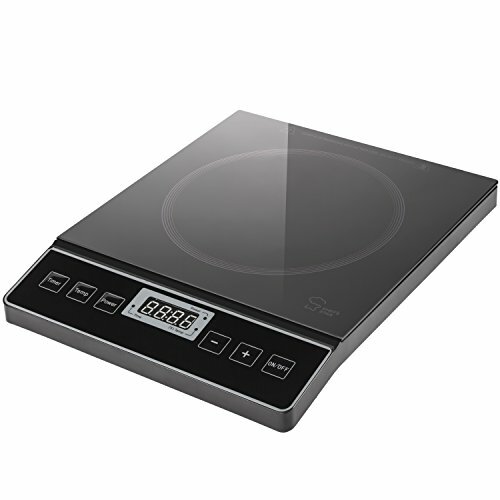 One countertop induction burner which is reasonably priced, highly rated and popular is the Secura 8100MC. Our review compares it with the 9100MC. The Rosewill RHAI-13001 is a competitively priced induction cooker which includes both a small and medium-sized burner on a single compact unit.